Getting rid of last summer’s salmon? Here’s how to make your next catch last longer. For many Alaskans, spring is time to put the snowmachines away. It's time to clean the garage and get organized for the coming fishing season. 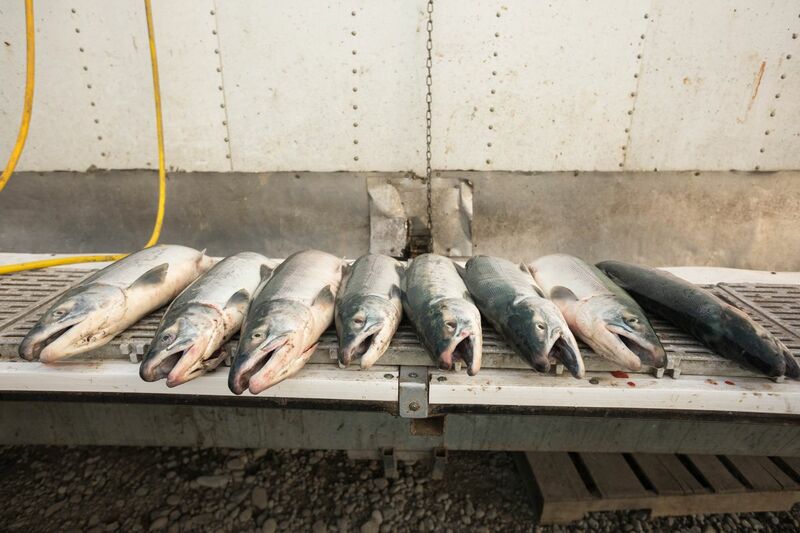 It's time to empty the freezer that's half full of salmon you caught last summer. The fish didn't quite get used up. Why? Well, because the taste isn't the same as it was back in October. Actually, if the truth is admitted, your salmon from the freezer never had the same wonderful flavor they did on the day they were caught. Why is that? Quality control. Catching fish is just the first step in fish management. A few years back, I took a quality control class for commercial fishermen who wished to market their own catch. The Canadian dude who taught the class was really good. We took a pink salmon that weighed three pounds and a coho that went about eight pounds. We injected a little computer-programmed chip alongside the backbone and put them in a household freezer. The chips were set to record the temperature every ten minutes. The freezer held at plus-5 degrees. Five days later, we pulled the fish and checked the temperature graph. The pink salmon took 70 hours to reach 32 degrees. The coho was not yet frozen all the way through. So much for top quality. To get great frozen fish, you must freeze them quickly. A decent commercial fish is blast frozen or frozen with a plate freezer to minus 10 in less than eight hours. You are not going to achieve that in a household set-up. Make your catch thinner so it freezes solid faster. Fillet your fish. To make mom and the kids happy, pull the pin-bones with a pair of needle-nose pliers. Vacuum pack your catch if you have the opportunity. Lacking the vacuum set-up, you can wrap the fillet in plastic wrap and put them in a freezer quality zip-lock bag. Squeeze out all of the air and put it in the freezer. If you can put it on a rack so the package can get cold from all sides, that is best. Don't stack the fish until they are frozen solid. Yes, this method takes longer, but you won't be taking your unused (and wasted) catch to the neighborhood dog musher or the zoo. Fish frozen with the ziplock method will hold for most of the year without substantial quality loss. Vacuum-packed sockeye taste great for 18 months. There are other ways to preserve fish. Smoking is a great alternative. The small electric-operated smokers, while not quite as good as a real outside smokehouse, are more than decent. The key is a simple brine. The most common brine is a 100 percent saltwater solution (add salt in the water until no more will dissolve). Some add a little brown sugar, honey or molasses. How long you leave the fish in the brine is up to individual taste, but 20 minutes is an average time. The trick to a special smoked product is to cut your strips thin enough so the temperature will be even throughout the strips as they smoke. Thin strips will not require as much heat to cook all of the way through. Fish done this way will still require freezing to keep them longer than a week, so freeze the smoked product the same way as fresh. Outside smokehouses are the best. A slow alder smoke on a sockeye or coho strip is hard to beat. Fish preserved correctly in an outside cold smoker will keep without refrigeration for months. Strips should be one-half to three-quarters of an inch thick. Brine the fish. Pick a sunny day suitable to hang the fish outside so they get a bit of a crust started. The first stint in the smoker should be for at least 24 hours. After the first day, you can alternate between smoking and drying in 12-hour increments. It there's rain or high humidity, the product will need to stay on smoke. The fish are done when they are rubbery and dark in color all of the way through. Smoked or fresh salmon can also be preserved in jars. Wide-mouth pint jars are a good choice. They are easy to pack and they hold about the right amount of fish for most recipes. Pressure cook fish at 12 pounds of pressure for 110 minutes. If you know you are going to pressure cook your smoked catch, you might opt to smoke for only a few hours — just enough to get the smoke flavor but still allow the fish to flake a bit. There are other methods, not quite as mainstream, to adequately preserve fish. Making lox, salting and even using a ground-burial method are all still utilized, although salt fish and ground burial — also known as stink fish — may require extreme care and a special palate. However you choose to take care of your catch, that extra bit of time as soon as you get home will pay big dividends later in the year. Go fish — and be able to take pride in your catch next April.